“Today I enjoyed an Endymed and Fire and Ice treatment to my 70-year old face at the S-thetics clinic. What an amazing transformation. 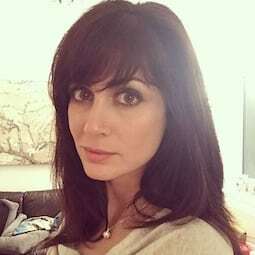 The procedure has given my skin a beautiful, healthy glow and plumped up my cheekbones, which in turn has markedly reduced the nose to mouth lines I had (unhappily) grown so used to seeing in the mirror. Before and after photos of left side face after S-Thetics Signature treatment, combined skin tightening and Fire & Ice facial treatment for rapid reduction of wrinkles, fine lines with glowing, hydrated skin. After photo taken immediately post treatment. 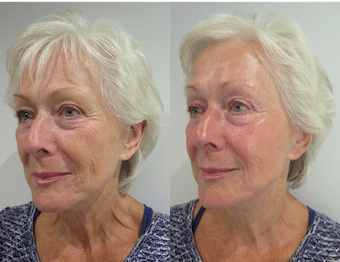 Before and after photos of full face after S-Thetics Signature treatment, combined skin tightening and Fire & Ice facial treatment for rapid reduction of wrinkles, fine lines with glowing, hydrated skin. After photo taken immediately post treatment. Our skin tightening with Endymed 3DEEP® and Fire & Ice facial treatments both deliver excellent results, but our Signature treatment incorporates both of these to deliver the ultimate combination. The Endymed treatment involves the non-invasive application of radiofrequency which feels like a deep warming of the skin to stimulate collagen growth. This is followed by the luxurious Fire & Ice facial treatment which is a multi-step treatment with two masque applications followed by application of a serum and a cream to soothe and moisturise the skin. The Signature treatment takes between 1-2 hours, depending on the number of facial areas being treated. There is little or no downtime however you may experience slight redness and tingling post treatment, which will quickly subside. We will identify any underlying issues during your VISIA digital skin analysis and customise your treatment accordingly. For long term results, we recommend a skin program of 6 treatments, each taken 1 week apart. However the Signature treatment is ideal for special occasions such as weddings, parties and birthdays to give your skin an instant boost.